MARY Valley father Brian Rasmussen said he thought the State Government would be a good landlord to rent his home from. He's since changed his mind. Aborted plans for the construction of Traveston dam pushed Mr Rasmussen and his family out of their government-leased home at Federal because it was in the way. Then the family was turfed from another government-leased home on the Bruce Hwy to make way for upgrades. Now, for the third time, the family of seven is looking for a new home after the State Government told them to move on yet again. 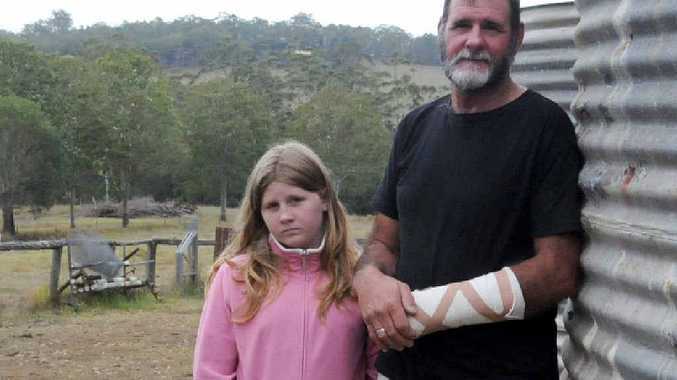 Brian and Donna Rasmussen moved to their current home on Knobby Glen Rd, Kandanga eight months ago but have been told to go because their home, bought by the state to make way for the dam, was to be sold. It was the government that supplied the family with the lease for the home after their previous lease at the highway ended; however the family said they wouldn't have moved in had they known their stay would be cut so short. They said they were also unaware of several problems at the home including a full septic tank which over-flowed into the backyard and bathroom during the January floods, and a cracked rainwater tank that has resulted in the family carting drinking water by hand to the house. Three months into their six-month lease, they family was told they would have to move at its end. Despite months of constantly seeking new rental homes, the family still has nowhere to go and only one more week to figure it out. "We've not sat idle," Mr Rasmussen said. "We don't want to stay here. "If someone rang me up today and said they have a place, we'd be gone," Mrs Rasmussen added. Mr and Mrs Rasmussen, regulars at several local real estate agents, said the clock was ticking but a lack of rental properties in the Valley because of blanket government ownership had made appropriate accommodation for their family of seven and their two dogs, poultry and horses, scarce. The said they couldn't leave the region because of their daughter's traineeship, but said competition for housing had been intense as numerous families in similar predicaments applied for the same houses in the region. "We're just the tip of the iceberg," Mrs Rasmussen said. To make matters worse, Mr Rasmussen was recently injured at work which set the family's rental applications back because they could not list any work income. Mrs Rasmussen said the family had found a new home at Amamoor, but it wouldn't be ready until the end of next month if everything went to plan. She said she appreciated the government granting the desperate family two extra months at the house, but that tenancy was due to end next Friday and a warrant for police to forcibly remove them had been ordered. She said the thought of police arriving at the door was stressing her children and she was no longer able to sleep at night. "We were certain we would find something in two months," she said. Mrs Rasmussen said all the family needed was an extra three to four weeks at the property to tide them and their livestock over until the Amamoor home was available. But the government has refused the extension, despite the family offering to keep the property presentable while open house inspections were conducted. She said the house next door, also government-owned, had been vacant for the past year and robbed in that time. Other state-owned properties once lived in by their friends but now empty were now derelict, vandalised and some had termites. While Mrs Rasmussen said the family was packing to leave the Knobby Glen Rd property at the end of the agreement, they remained entirely uncertain about where they would go. "It's the not knowing that's the hardest part to live with," she said.